WATCH LIVE COVERAGE: Pope Francis visits the U.S. Sweeping through the landmarks of America's biggest city, Pope Francis on Friday offered comfort to 9/11 victims' families at ground zero, warnings to world leaders at the United Nations and encouragement to schoolchildren in Harlem as he mixed the high and low ministry so characteristic of his papacy. In the early evening, he led a jubilant parade through Central Park past a crowd of about 80,000 and celebrated Mass at Madison Square Garden, usually the site of basketball games and rock concerts but this time the scene of a solemn service celebrating New York in all its diversity. "Living in a big city is not always easy," Francis told 18,000 people at the Garden, easily one of the most respectful crowds the arena has ever seen. "Yet big cities are a reminder of the hidden riches present in our world in the diversity of its cultures, traditions and historical experiences." Francis' itinerary for his only full day in New York was packed with contrasts befitting a head of state dubbed the "slum pope" for his devotion to the poor. He moved from the corridors of power to the grit of the projects with lush Central Park in between. He drew huge, adoring crowds while also managing to connect one-on-one with countless New Yorkers, despite extraordinarily tight security that closed off many streets and kept most spectators behind police barricades. "As he passed by, you passed a cool, refreshing peace, as if he were spreading a huge blanket of peace through the crowd," Ruth Smart of Brooklyn said of the procession in Central Park. "Even though the crowd exploded in a roar, it was pure joy." On Saturday morning, he flies to Philadelphia for a big Vatican-sponsored rally for Catholic families. As many as 1 million people are expected for the closing Mass on Sunday, the last day of Francis' six-day, three-city visit to the U.S., the first of his life. As Friday's Mass came to a close with a sustained and thunderous roar of applause, the toll of the long day seemed evident as an exhausted Francis walked with assistance down the stairs of the altar. 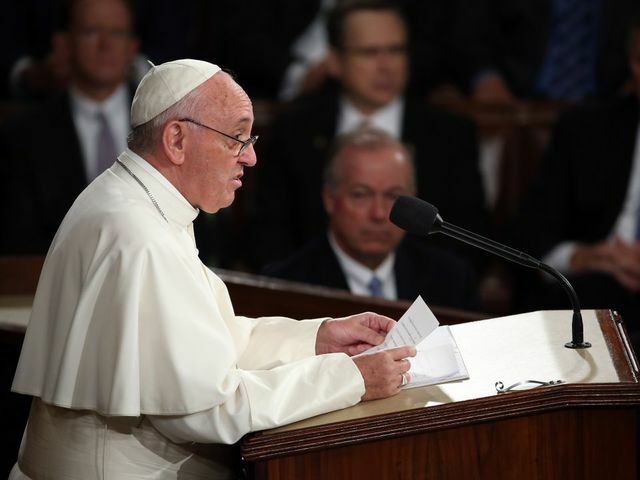 In his speech at the U.N., the pope decried the destruction of the environment through a "selfish and boundless thirst for power and material prosperity." He declared the environment itself has rights, and that mankind has no authority to abuse them, presenting his environmental mantra live before world leaders in hopes of spurring concrete commitments at the upcoming climate-change negotiations in Paris. He demanded immediate access for the world's poor to adequate food, water and housing, saying they have the right to lodging, labor and land. Francis' speech, delivered in his native Spanish, received repeated rounds of applause from an audience that included German Chancellor Angela Merkel, Bill and Melinda Gates, and Nobel peace laureate Malala Yousefzai, the young Pakistani activist shot and gravely wounded by the Taliban. The ovations contrasted sharply with the moment of silent prayer during the pope's visit later in the morning to ground zero for an interfaith tribute to the Sept. 11 victims. After praying before the waterfall pools that mark the spot where the twin towers once stood, Francis met with relatives of the 3,000 victims whose names are inscribed on the water's edge. Among those on hand was Monica Iken-Murphy, whose husband, bond trader Michael Patrick Iken, died in one of the towers. "This is where loved ones lost their lives ... and this is the way we are going to honor them by having someone who is holy, closest to God, Pope Francis, come here and bless this site," Iken-Murphy said. "I couldn't be prouder to share this memorial and museum with him." Francis' afternoon schedule reflected the penchant of the "people's pope" for engaging with the public, starting with a visit to Our Lady Queen of Angels School, set amid public housing in the heavily Hispanic neighborhood of East Harlem. After the morning's deadly serious activities, the 78-year-old pope clearly perked up when he got to the Catholic school. He joked around with the children, chatted happily with them in Spanish, shook hands and posed for a few selfies. A security guard intervened when one girl gave him a big hug. The pope — who says he hasn't watched TV in decades and doesn't know how to work a computer — even got a lesson in how to use a touchscreen from fourth-grader Kayla Osborne, age 8. The crowd in the gym included about 150 immigrants and refugees, some of them in the U.S. illegally. In his remarks, Francis recalled the Rev. Martin Luther King Jr.'s "I Have a Dream" speech, saying: "His dream was that many children like you could get an education. It is beautiful to have dreams and to be able to fight for them." From Harlem Francis headed toward Central Park, where he smiled as he rode slowly in his open-sided Jeep past a cheering, shrieking crowd and a sea of arms holding cellphones aloft. For those lucky enough to score a ticket, there was a catch: No backpacks, no chairs and no selfie sticks. About a half-hour before the popemobile passed through, a rainbow suddenly appeared above the crowd, which erupted in joyous "Oooohs!" and "Ahhhhhs!" Denise Villasenor, a 27-year-old Columbia University graduate student from the Philippines and a Catholic, practiced capturing a selfie with the pope ahead of the procession. "The pope's positions always revolve around compassion and love — you know, being a person for others," she said. "Immigration, the environment, it all comes to being compassionate, for others." During the visit to the United Nations, the Vatican flag was raised there for the first time. The General Assembly recently agreed to allow the U.N.'s two observer states, the Holy See and Palestine, to fly their flags alongside those of the 193 member states. Although his U.N. remarks on the environment and the economy carried a message many liberals welcomed, Francis also affirmed church doctrine on abortion and sexuality. Among other things, he called for the "absolute respect for life in all its stages," including the unborn. Contributing to this report were Associated Press writers Edith Lederer, Cara Anna, Karen Matthews, Jake Pearson, Deepti Hajela, Claudia Torrens, Verena Dobnik, William Mathis, Jackie Snow, Jonathan Lemire, Jennifer Peltz, Colleen Long and Rachel Zoll.